Os Arsenalistas are about to face their namesakes, in a clash which sees Europe’s most consistent Champions League Qualifiers, Arsenal, take on S. C. Braga in their first campaign. The 2009-2010 league season was excellent for Braga. Under Domingos Paciência they led the Portuguese league for much of the season, losing out to Benfica in what was a two horse race. Finishing second was still an unprecedented achievement for a club generally considered inferior to the ‘Big Three’ – Benfica, Porto and Sporting Lisbon. Braga are a good side, and have built the foundations for success on sound financial management. Progress is a running theme, and they have finished in the UEFA Cup positions in the Liga every year since 2004-2005. Although they failed to make it past the qualifying stages of the Europa League last season, this year they dealt with the pressure of two difficult rounds of qualifiers to attend first ever Champions League campaign. Results in the qualifiers indicate Braga’s weaknesses away from home, facing Celtic, winning 3-0 at home but losing 2-1 away and then Sevilla in the fourth qualifying round, winning 1-0 at home, and then beating Sevilla 4-3 in an exciting game – almost going out in the process. Over 2009-2010 they played a 4-2-3-1 system with a very tight defensive unit, and a ‘doble pivot’ in midfield. This season Vandinho and Salino have started well, and continued the good work as the central midfield pair. Vandinho plays the role of ball winner, whilst Salino sits alongside him. Braga’s compact 4-2-3-1, with the doble pivot of Salino and Vandinho sitting deep in front of the defence. The squad have something akin to a rash of Brazilians, over 20 in the squad, and unsuprisingly one of the main attacking threats is the skillful Brazilian, the brilliantly named Alan. A pacy player, Alan plays wide on the right, and is the focus of much of the passing in Braga’s counter-attacking. Passing distribution against Sevilla in the first leg. Alan, Salino and Vandinho seem to be the hub of the team, interchanging passes, and creating attacking moves down the right, although their completion rate leaves something to be desired. Meanwhile either Lima or Matheus are used effectively up front alone, with another player deeper in attacking midfield. A Lima hattrick saw Braga through that crazy night in Sevilla, after conceding late goals which put their qualification in jeopardy. The record of both strikers is good, Matheus has scored 3 in 4 games, whilst Lima’s hattrick puts him on 3 in 4 too. The team really do keep it tight, sitting deep and attempting to hit the opposition on the break, which somewhat reminds me of Aston Villa under Martin O’Neill. The defensive statistics bear this out – last season the team conceded just 20 goals in the league, and scored only 48. By contrast Benfica and Porto, first and third respectively, goals tallies were both in the seventies (see table above). The depth of Braga was clear in their recent difficult games against Sevilla away in the Champions League, and Porto away in the league. Braga in black against Sevilla in the second leg, the team sits behind the halfway line, only pressing when the opposition come into their zone. In Sevilla, during the second leg Braga only attempted 219 passes and their possession was low, at just 37%. However, this was an away game in Europe where they were defending a 1-0 lead. Even so the pass completion rate was an abysmal 50%. Qualifying the poor passing with the statement that it was a defensive away game is justifiable, but it leads me to compare this with the home leg – where you might think that Braga would look to take the advantage – and even here Braga only managed 40% possession. They attempted rather more passes 354, still only completing 59%. Compare this to Sevilla’s stats – 547 attempted passes, completing 412 or 75%. What these statistics prove is that Braga are a counter-attacking side. They will allow the opposing side possession in the hope that they can hit them on the break. This tactic can work well, but away from home in Europe only very high quality teamwork will allow a clean sheet, and goalscoring opportunities will also diminish as the quality of opposition increases. Vandinho launches a typical counter-attack – playing the ball to Matheus, with Alan and Cesar sprinting forward. In Liga Sagres Braga are sitting in third place after four games, but on Saturday suffered a draining defeat away to an impressive Porto side. 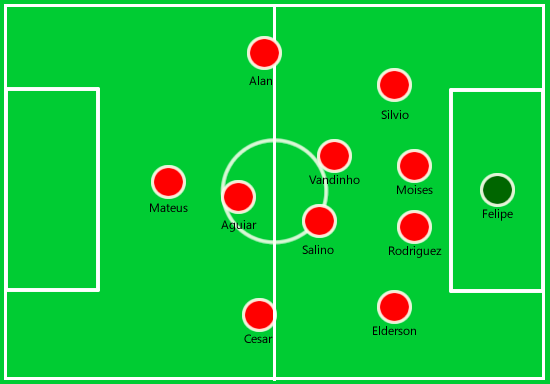 They played in the same pattern as in the Champions League, however the formation was more a 4-4-1-1 than 4-2-3-1 with Aguiar playing behind Lima, and the wingers more withdrawn into line with the ‘doble pivot’ of Vandinho and Salino. Braga used eleven men pressing only within their own half, keeping compact and making it hard for Porto to find a way through. Sitting deep against Porto, here they have just won the ball back, but every player with the exception of the striker is within their own half. The back four played quite narrow, which did leave them open to attack on the flanks, especially when Alan and Cesar did not track back. Indeed Porto’s first goal came after the fullback Elderson allowed a Porto player easy passage out wide to put a cross across, and it was headed home. Arsenal should note that Chamakh thrives in these situations, any cross into the area near the back post is dangerous with him on the pitch. The importance of tracking back – here, in the second leg qualifier against Sevilla, Alan tracked back from his position on the right wing to help the right back pressure the Sevilla player (far left). This is crucial in maintaining stability within the team, and stifling opponents. Even more interesting was the fact that the Porto winner, at 3-2, came at a moment when Braga had lost their defensive shape and pushed forward. A Porto ball over the top exposed the back four without their midfield cover and Porto capitalised. 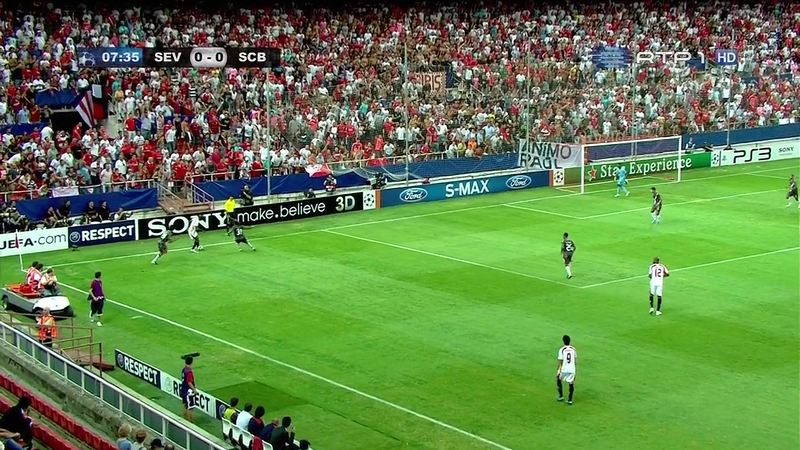 Expect Braga to cede possession to Arsenal and try to hit them on the break, whilst keeping bodies behind the ball. The team still manages to play exciting and enterprising football at times, but the end product will be harder to achieve against Arsenal, especially considering Arsenal’s good record in the group stages at home. The midfield battle could prove good watching, as Vandinho takes on the likes of Fabregas in front of the back four, and Arsenal may pressed for space in midfield, unless their superior passing dismantles Braga. The game could pivot on the first goal, if Arsenal take it then Braga will have to push out, and could more easily concede a second. Whilst if Braga take the lead we know they can shut out teams (Sevilla 1-0 first leg), but the recent goals conceded against Sevilla and Porto seem to suggest that they are too fragile against top opposition. A nice refreshing, objective post. Thank you Sir. Very Nice! I hope Arsene Wenger takes a look at this post. 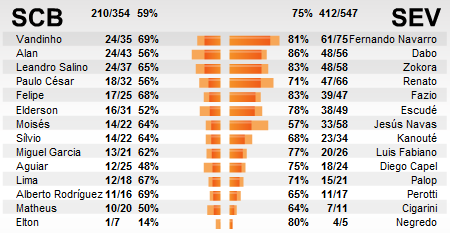 Also, I don’t think Arsene Wenger is taking this match lightly. If Braga are expecting an overconfident Arsenal, they can forget it. The fact that Wenger rested both FB’s, it shows that he has given high priority to this match. Nice article, add value with a lot of thinking and pre work, help to understand what toexpect from Braga. Having said that i’d still expect comfortable 3-0 win from the gunners. A good, well researched article. I just recently found this blog and look forward to your future posts.